Butterbur (Petasides hybridusis) a shrub that is commonly found in Europe — and less commonly in Asia and North America. The roots, stems, and leaves are used in supplements. It has a range of beneficial health effects, but is most often used as an alternative to pharmaceutical antihistamines. Butterbur is typically used as a natural alternative to over-the-counter (OTC) allergy medicines. It alleviates many of the symptoms of hay fever (sneezing, stuffiness, coughing, and irritation) similar to a pharmaceutical antihistamine. Butterbur is also taken to reduce both the pain of migraines and the frequency of attacks. Some of the main uses for butterbur include allergy relief, treatment for migraine symptoms, and reduction of migraine frequency. A number of medical studies support butterbur's function in this area. A double blind study comparing butterbur and cetirizine (the main ingredient in Zyrtec) found they caused very similar improvements in patient symptoms with the advantage of not having a sedative effect. A similar study found it as equally effective as fexofenadine, the active ingredient in Allegra. A 2003 study found that butterbur specifically reduced nasal responsiveness when allergic patients were exposed to grass pollen. And a 2004 controlled study of 186 general hay fever patients found that when compared to placebo, the shrub proved effective for intermittent symptoms. Butterbur also has some scientific support in the treatment of migraines. A 2000 study found that after four weeks of treatment, baseline frequency of migraines in a group of patients was reduced by 60%. A 2004 double blind placebo controlled study found that migraine frequency was greatly reduced in the group of patients given a high dose of butterbur (little change was seen between those given a low dose and the placebo group). Herbal supplements are not regulated by the FDA and have no established recommended daily allowance (RDA). Supplement manufacturers generally set the dose at 50mg to 75mg twice daily. However, current studies are not entirely clear on the minimum effective dose for either allergy or migraine use. 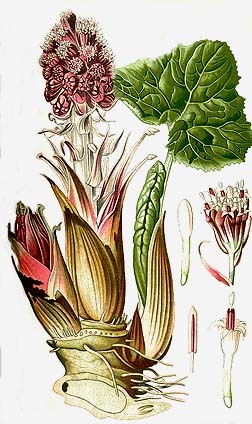 Butterbur is sold in a capsule containing ground powder made from the root, leaves, and stem of the plant. Butterbur has been found in research to sometimes cause mild gastrointestinal discomfort. The FDA does not regulate herbal supplements. A doctor can best advise you on a course of treatment for hay fever, seasonal allergies, and migraine treatment. Some preliminary research has been done on butterbur as a treatment for the symptoms of asthma, but this is still in the experimental stages and has not yet been recommended by any medical authority. Butterbur is in the same family as the ragweed plant and may trigger that particular allergy. In its natural form, butterbur contains pyrrolizidine alkaloids. A build-up of too many of these in the body can cause a toxic reaction (pyrrolizidine alkaloidosis), which has a very wide range of potential negative health effects, but is particularly damaging to the liver. The FDA does not mandate the filtering of pyrrolizidine alkaloids from butterbur supplements, but they are relatively easy and inexpensive to filter and many brands do so voluntarily. This information should be available on the label. 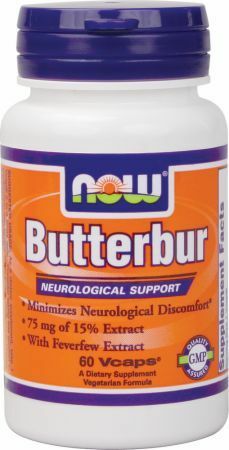 You can find butterbur supplements right here at PricePlow and at 30% to 50% off of retail prices. Sign up for future Butterbur deals and coupons! Click the button below to sign up for future Butterbur deals, news, and coupons! With Feverfew - Supports neurological function, helps with some allergies, and more!